The above quote by Bill Shankly is one of my favourites regarding football and the passing style associated with Liverpool football club. The question is whether there is a way of assessing this “simple” aspect of the game that Shankly speaks of? A method of assessing passing within a team that has been increasingly used in football, is network analysis. This treats players as “nodes”, through which passes connect each player within the team. The number of passes played and received by each player is collated according to the player they passed to and who they received from respectively. Using this, you can examine who passes to a particular player and who they pass to themselves, along with how often they do this. Below is an example of such an analysis from the Liverpool vs Gomel match in the UEFA Europa League from the 9th August 2012. The data is for Liverpool and shows completed passes only. The larger and darker the arrow is, the greater the number of passes played by one player to another. The positions of the players is based on the rough formation that I thought Liverpool played in (I think Skrtel and Agger might have been higher up the pitch but the diagram is clearer if there is more space between players). Owing to a lack of official statistical resources, I manually collated the passing data for each member of the Liverpool team, which was quite time consuming! Unfortunately, the on-demand replay of the game from ESPN was missing 5 minutes towards the end of the match, so there are some passes missing. After checking the completed passes data collated by the dedicated and excellent Anfield-Index in this piece with what I collated, I only missed up to 5 extra completed passes for some players, which shouldn’t make too much of a difference to the analysis. 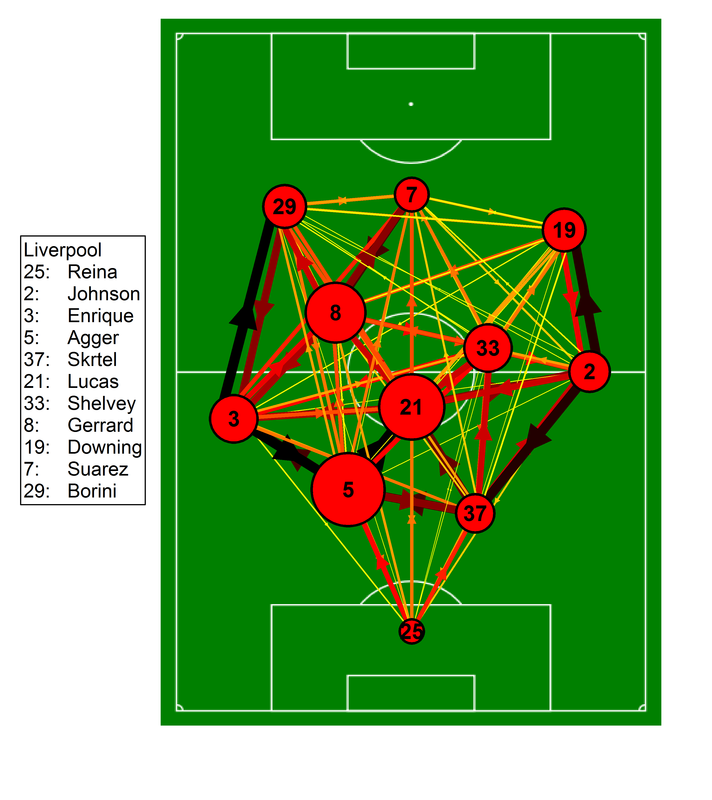 Passing network for Liverpool from the home match against Gomel. Only completed passes are shown. Darker and thicker arrows indicate more passes between each player. The position of each marker is approximate and the size of each marker is related to their closeness centrality, which is described in the text below. Passing data was collected manually. One of the key themes in the network above is the apparent prevalence of 3 or 4 players interchanging passes in different areas of the pitch. For instance, Reina often played the ball to his centre-backs, who often dropped deeper and wider to collect the ball, where-after they often recycled the ball between themselves. Further up the field, the centre-backs would form triangles with their full-back and nearest midfielder (often Lucas). You can also see this to an extent on the left-hand-side where Enrique, Borini and Gerrard linked up. Another key feature, particularly in wide areas was the number of passes played back and forth between two players, which was used to retain possession and to advance the ball further upfield; note the reciprocal arrows between Agger-Enrique, Enrique-Borini, Skrtel-Johnson and Johnson-Downing. Borini in particular often received the ball and then played it back first-time to whoever passed it to him. The relationship between Suarez and Gerrard in the final third was also evident watching the game with lots of short passes between each other with excellent movement thrown in for good measure. This connection is evident in the passing network, with Suarez being Gerrard’s most frequent target with his passing and vice-versa. The above gives an idea of how the passing network fits together as a whole but there are several measures that can assess which are the most important parts of the network. One such measure is known as “closeness centrality”, which in this context is dictated by the number of passes played and received by a given player. Crucially, this measure is greater when the passes that the player plays and receives are distributed more evenly across the team. So for instance, if a player makes 100 passes in a match and receives the ball 100 times, they would have a greater closeness centrality if they passed and received the ball 10 times to and from each team-mate compared to if they simply passed the ball back and forth to just 1 team-mate. Players with a larger closeness centrality score can be interpreted as dictating the passing network by having an impact upon the movement of the ball around the team. In the figure above, the size of the players marker is dictated by their closeness centrality score. Daniel Agger, Lucas Leiva and Steven Gerrard are Liverpool’s major performers on this score. Agger outscored Lucas partially due to their differing passing accuracy (98.8% vs 90.8% according to Anfield-Index) as they received the ball a similar amount but Lucas misplaced more passes. Lucas’ accuracy may well increase as his match fitness increases. Gerrard was clearly the play-maker in the attacking third with good link up between Borini and Suarez along with spreading the play to Enrique and Johnson as they overlapped from full-back. This distribution throughout the spine of the team represents a potentially beneficial division of responsibilities; having a single player with a much larger centrality score could have negative consequences as a team can become overly reliant on a single player. Such players are likely to be crucial to the style of play favoured by Brendan Rodgers this season. Agger and Lucas in particular had a strong linkage, acting as the fulcrum of the team in the recycling and transition phases of play. Higher up the pitch, Gerrard dictated play in the attacking phase, often linking with Suarez quickly and dangerously. Liverpool’s prospects this season may well depend on fielding these players together, something that didn’t happen at all last season. If anyone knows of any sources which collate passes played and received by each player then please let me know in the comments. I don’t have access to Stats Zone unless they launch an Android version and I would be interested in looking at these networks more as the season progresses. I don’t have the time or inclination to collect these manually over the course of the season; once was more than enough! This entry was posted in Liverpool, Network Analysis, Passing and tagged Daniel Agger, Gomel, Liverpool, Lucas Leiva, Network analysis, Passing, Steven Gerrard by Will Gurpinar-Morgan. Bookmark the permalink. That’s an interesting use of network analysis. It looks pretty clear to me that much of the play has been down either flanks. The main way through the middle towards Suarez was through Gerard sure, but the edges of the fullbacks and the wide forwards are clearly self evident. I wonder if a network graph of barca would show the same width, as I know that tended to be their problem in the past few seasons when they struggled. I also wonder, with joe Allen due to play in the midfield, less of play will be between the fullbacks and the wide forwards, and more of it will be joe Allen spraying diagonals to the wide forwards with the fullback overlapping, which is much more of the 433 template. In-betweeness might be an interesting measure to show here, midfielders should score higher. Thanks for the comment and yes much of the passing was down the flanks. One of the things I noticed when collating the data was how often the wide players would pass it back and forth to each other to move up the pitch and then try and feed the more central players. Barcelona would be interesting to look at yes. I imagine most of the width comes from Alves with the rest of the play between the central players. I’m planning to look at other centrality metrics but I didn’t want to overload the piece with lots of measures at this stage. With the wide players, that seemed to be the case last season as well. There was a lot of back and forth between downing and enrique, who BOTH can be ponderous on the ball and at times it was very frustrating. I don’t think that worked at all because the more central players were more easily marked out last season in a 4-4-2. In a 4-3-3, there should simply be an extra option and more angles to pass back to the centre-mids. One of the limitation of looking at network graph is that, the position of the nodes are largely down to computer generations, and are somewhat arbitrary and you can definitely impute meaning where it doesn’t exist (yes, I know you re-positioned the nodes). I’d be interested to see where someone put Alves in Barca, as he was often ahead of the right sided inverted winger. When David Villa was fit, he kept the width of the left side extraordinarily well, his injury last season was tactically challenging in terms of width besides the goals he contributed. Perhaps you can utilize those heatmaps that shows the average positions of players on the pitch, which would be akin to someone I used to do research with combined network analysis with GIS. Sorry, I have my research paper writing hat on. Anyway, keep up with good work. Must’ve taken you awhile to put this together! Thanks. Spent quite a bit of time reading around but didn’t take too long to write some code to display the diagrams once I had it figured out. Definitely the worst bit was collecting the data! Taking account of the moving of the nodes would be very interesting. Do you have a link to the paper that your colleague did? Would be interested in having a read. Hopefully the passing and movement on the flanks will improve this season. Borini in particular loves a first time pass back to whoever passed to him plus he movement looked good so hopefully that will help. Separating Downing and Enrique might help as well. That’s a fascinating analysis, hope you’ll be able to provide more of similar with some of Liverpool’s Premier league games when the season starts. Thanks. I’ll hopefully get my hands on the data so I do this fairly regularly.